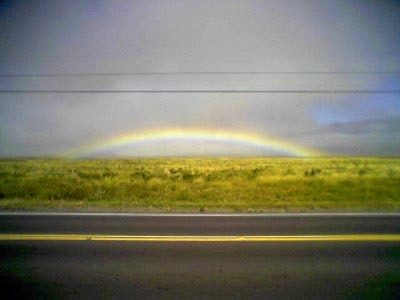 More rainy weather for Waimea and this rainbow popped-out over Parker Ranch pasture land as I was driving back to Kona. There were quite a few cars stopped on the side of the highway to take in the colorful sight. 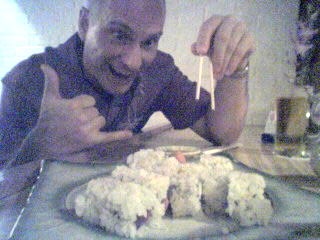 Brian digs into some sushi at Izakaya Kai sushi bar in Kona. Not only did we have three kinds of sushi there but chips and salsa too! Not that they serve chips and salsa every day, it was just on the menu for Cinco de Mayo. Good sushi, some Kirin Ichiban beer and some hot udon soup for Karen who’s nursing some kind of cold. Karen headed home, Brian and I headed for Hard Rock Cafe. 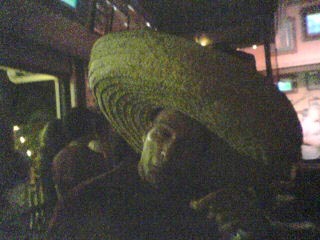 Off to HRC to listen to a Latin band playing and Brian got the bartender to hand him this sombrero that was on the bar, he ended up leaving HRC with it. The music was excellent, the crowd danced all night. Our friend Ruben played the drums in the band. He’s quite the runner and can usually be found in local races like the Peaman events. Tall Andrea joined us, Brian left, TA checked-out the Latino guys and we closed down HRC. Note that the Latin music band will be playing at Beachcomber’s in Kona on Sunday night so that’s where we’ll probably be.